– graduate of the Faculty of Law at Charles University in Prague (1996), awarded Master of Laws (LL.M.) at the University of Florida, USA (1999). He began his legal career at a German law firm, later moving to the business sphere, where he headed the legal department of an industrial enterprise. After a short intermezzo as a counsel for justice and public administration at the EC Delegation for the Czech Republic’s EU accession negotiations, he returned to private practice. 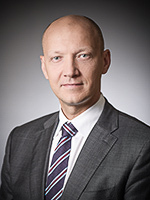 He focuses on foreign investments in the Czech Republic, corporate law, M&A and international business.